Financial Reporting Experts are experienced in assisting companies prepare annual reports and IFRS consolidated financial statements as well as financial and related commercial texts and commercial law documents. Our training and experience with business and commercial texts ensures that we have a fundamental understanding of the documents we prepare. In addition we have a strong network of reliable, experienced professionals in related professions for example auditors, tax advisors, lawyers and valuation experts, who can be called upon to provide related support processes as required. 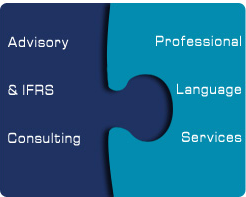 We aim to ensure that accounting processes remain transparent and uncomplicated. We particularly value strong, long-term partnerships with clients, and we like to get to know our customers well. We place a high value on continuity, so that we are able to offer consistency in the teams that we offer to our repeat customers.